Twitter is in mainstream, from corporates to celebrities to youths tweets. Check out the corporate branded Twitter accounts. 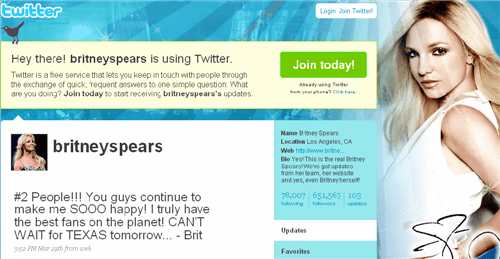 Do you know Britney Spears is one of Twitter’s most popular celebrity, as of this writing she has 650,385 followers. Here is the list of top celebrity Twitter Accounts (without any order 😉 whom you can follow). Dont’ forget to follow my twitter @thePicky. Do you think we missed some of the top celebrity here ??? ? Please share in the comments.